What's worse than losing in a Halo multiplayer match? How about losing at Halo because your batteries died? 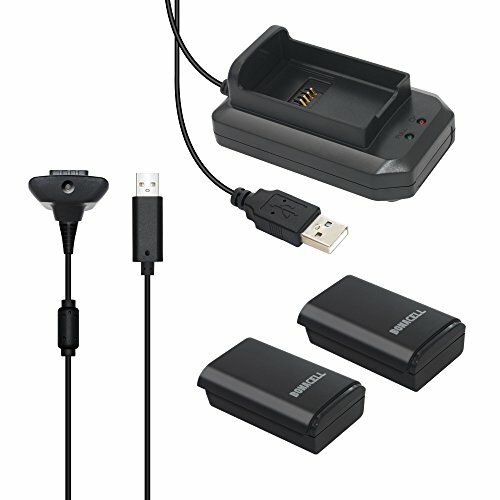 Keep your controller charged up and ready to go with the Energizer Power and Play Charging System designed for Xbox 360. It comes with a stand and two rechargeable battery packs. Compatibility: Xbox One controller, Xbox One S controller, Xbox One Elite controller and Xbox One X controller. Please charge the battery pack before your first use. Please use our included batteries for the charging dock. Free Yourself from the AA battery issues!Enjoy your play times without any worry. 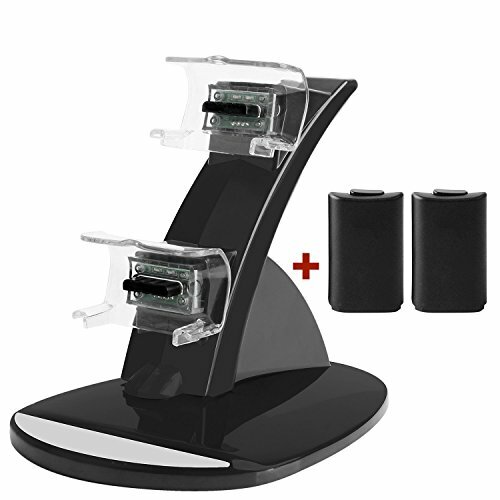 Store and Charge simultaneously two Xbox One/ One S Controllers with YTEAM Xbox Controller Charger Station. 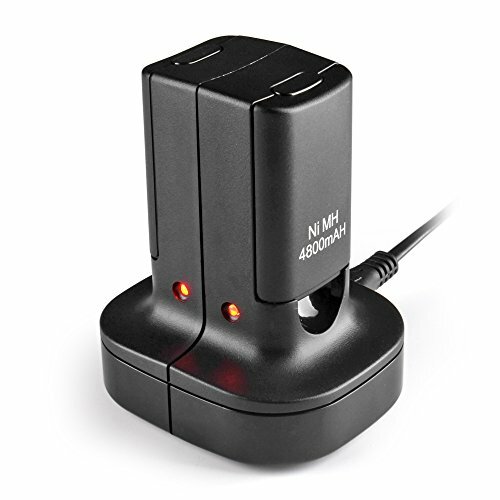 Fully charge your controller about 2.5 hours, Up to 8 hours of play time is achieved on the 1200mAh NiMH battery packs. Specially built to last, with a lifespan of over 1,000 charge cycles. One year warranty and 30 days money back guantee,Buy with confidence.Any questions with the item,Feel free to contact us. 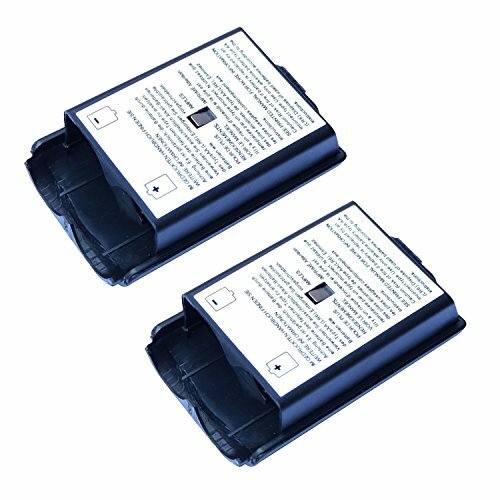 Design for Xbox One--Two rechargeable battery pack and one charging station for xbox one/one s/one x controller.Free yourself from the AA batteries issues. Quality Batteries Kit--Comes with 2 rechargeable 1200 Mah Ni-MH national certification batteries packs, Provide you up to 8 hours steady playing time. Multifunction--Over Charging/Current/Voltage Protection with the charging station.Low battery warning would display on interface before out of power. 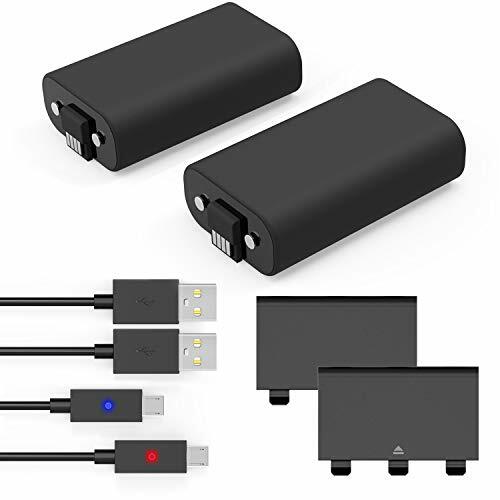 Kindly Note--This is Not Official or OEM charger kit for xbox one,Please charge your Xbox One controller with this batteries & charging station pack. One Year Warranty Policy--Buy with confidence!Any Concerns with product,Feel free contact us.We provide you 30 days money back and one year warranty policy. 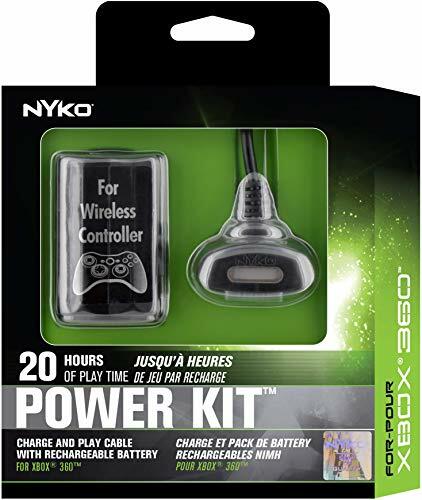 Package Includes: 2 x Replacement Battery Compatibility: Microsoft Xbox 360 / Xbox 360 Slim Product Description: 2 x Replacement Battery Compatible with: Microsoft Xbox 360 NOT compatible with: Microsoft Xbox, Xbox One Keep your Microsoft xBox 360 controller charged-up so you are always ready to strike the winning point Make sure you don't run out of battery before your big win by keep in an en extra, rechargeable Ni-MH battery on hand Best replacement for the original battery with comparable standby and talk time. Great bargain with excellent quality guaranteed Color: Black Power: 3600mAH Accessory ONLY, controller not included WARNING: This product can expose you to chemicals including DEHP, which is known to the State of California to cause cancer and birth defects or other reproductive harm. For more information go to P65Warnings.ca.gov. Product names are trademark of listed manufacturer or other owners, and are not trademarks of Insten Fulfillment. The manufacturer does not necessarily endorse use of these products. Package includes: 2 x Insten 3600mAh rechargeable battery for Xbox 360 controller. Play and recharge your Xbox 360 wireless controller's battery pack simultaneously. The Power Kit Plus includes two high-quality NiMH rechargeable batteries and an extra long USB charging cable. The battery provides up to 20 hours of play per charge while the extra long cable allows simultaneous play and charging up to 8 feet away from the console. The extended cord makes it easy to kick back at a comfortable distance from your TV without accidentally disconnecting the controller. Never worry about running out of battery power for your controller during play again. 2.Any concerns with this product,Feel free to contact us.Our services is standby 24x7 hours. Fast Charging--Speed charger with two quality battery could fast charge dual controller at the same time.Two hours full charge. Led Indicator--Stylish led indicator would indicate the charging status clearly,Red for charging, Yellow for full charge or standby. 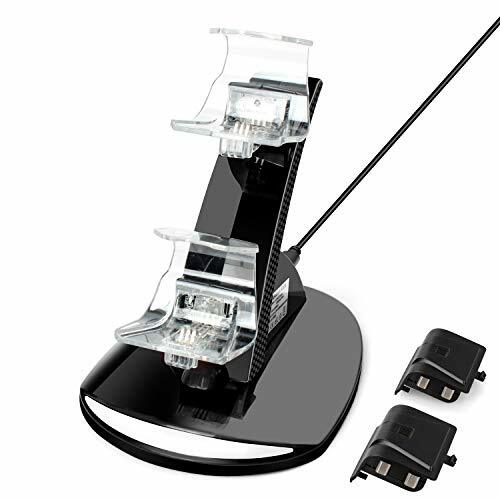 Easy to Charger--Built-in USB ports allows you to easy charger up two xbox 360 controllers,For example Wall charger,PC,or other usb power port. Services Support--Buy with confidence.90 days unconditional money back and one year waranty guarantee.Any concerns,Feel free to contact us. * Powered through USB port of Xbox 360 game console or PC or AC power adapter. * Two controllers can be charged simultaneously, one single controller could be fully charged within 2 hours, and two controllers just need about 4 hours by hi-capacity 5V/1A AC adapter. * Charging dock have dual distinct colored LED light indicator showing charge status: Red-Charging, Yellow-Charged. * 3.3ft/1M USB charging cable Included. The Xbox 360 controllers in the pictures are not included in the package. When power is supplied to the equipment, the red and yellow lights flash alternately 2 times and do NOT light at standby. Charging - Red. Charged - Yellow. Play and recharge your Xbox 360 wireless controller's battery pack simultaneously. The Power Kit includes a high quality NiMH rechargeable battery and an extra long USB charging cable. The battery provides up to 20 hours of play per charge, while the extra long cable allows simultaneous play and charging up to 8 feet away from the console. The extended cord makes it easy to kick back at a comfortable distance from your TV without accidentally disconnecting the controller. Never worry about running out of battery power for your controller during play again. Never miss a moment of your happy game time! The length of the controller charging cable is about 3 meters with LED indicator; Our long charging cable provides you with extra comfort and can also be used to charge your controller while playing; never miss a moment of your happy game time! New from factory. 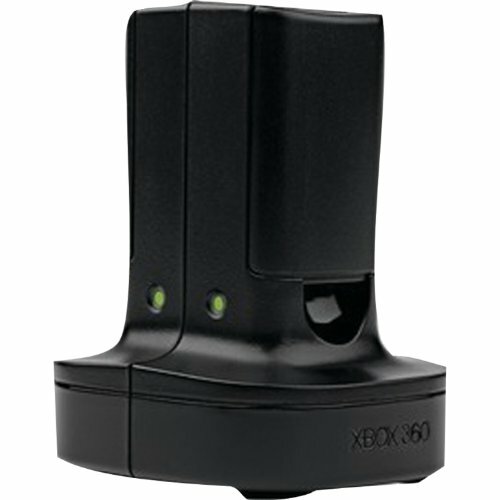 The battery pack cover for Xbox 360 is Compatible With Xbox 360 controllers. Compatible with: Xbox One/ Xbox One S/ Xbox One X/Xbox One Elite Controllers. Longer Lasting Rechargeable Batteries: Say good bye to AA battery,turning them into rechargeable battery packs,Xbox One charging station will fully charges your controllers in 2.5 hours and provides up to 5-8 hours of play time. LED Indicator: The red light and yellow light will turn on alternately one time when the xbox one charging dock power on. when the xbox controller is not connected to the xbox one charger station, the LED lights remains off. Intelligent Charging Protection: Excellent chip design for over-current/ over-voltage/ over-heating/ short-circuit protection. Battery Life: Up to 30-33 hours of standby time What do you get? 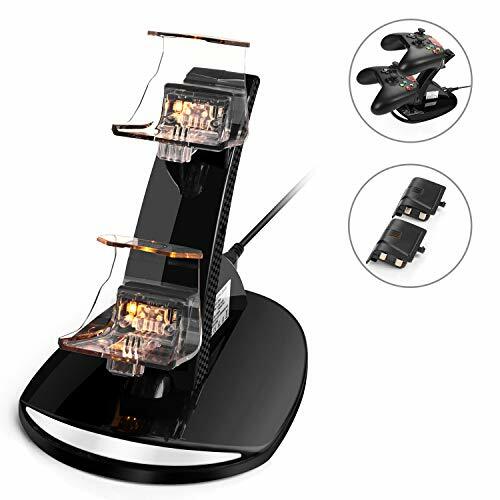 Special Design for Xbox one charger This xbox one charging station can store and charge two Xbox One/Xbox One S/Xbox One X /Xbox One Elite wireless controller simultaneously!Easy to operate, just put it down or take up conveniently. 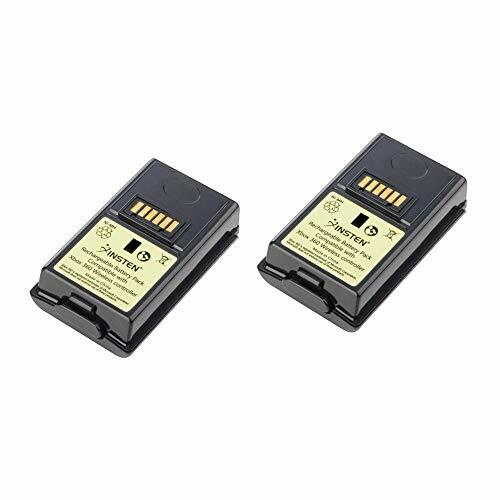 High Capacity Xbox One Rechargeable Battery Pack The xbox one charger kit is high speed fully charging only in 2.5h,comes with 2 rechargeable 1200mah Ni-MH battery packs,providing up to 8-10hours of playing time.Say Goodbye to AA Batteries forever! Two Ways for Fast Charging Just put the equipped controller on the xbox one charging dock when not gaming,and then it will begin charging automatically without needing removing battery pack.Or you can remove the battery and put the battery on the xbox controller charger to charge it.Red-Charging,Yellow-Charged,Light off-Standby. 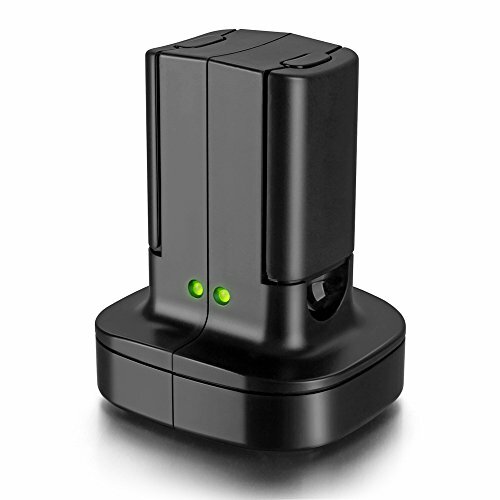 Safe and Smart The Xbox one charger station with 3 pieces shrapnel on each slot, better connection and more stable,Excellent chip design for Over-charging Protection, Over-voltage Protection, Over-current Protection, Short-circuit Protection. 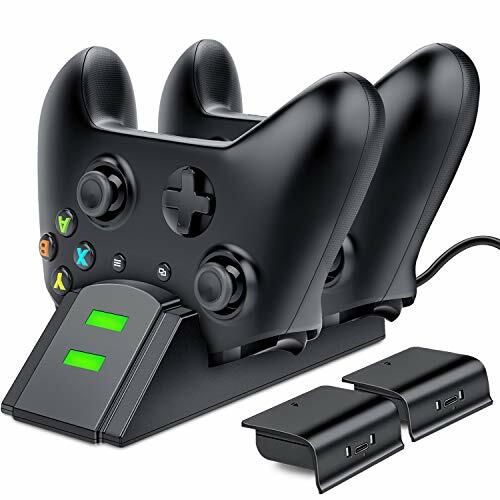 Making Your Choice Right You will get 1* xbox one controller charger dock station,2*1200mAh NiMH Xbox One Rechargeable Battery Packs,1*Micro-USB Charging Cable,1*User Manual, Worry-free 12-month Warranty,and 24-hour Friendly After-sale Service. Never run out of battery power when you are about to score the winning point. Made of high-quality plastic material and by meticulous producing, this battery is up to standard that you could use it without worries. Also, it utilizes thermal protectors and circuit breakers to ensure the maximum efficiency, reliability and safety of the battery. What s more, it features rechargeable function. You could charge it through an USB cable if it is running out of power, which is economical and friendly to the environment for its cyclic use. This rechargeable battery is a good device for you when you are at home, working or even traveling. Swap disposable batteries for the Xbox 360 Quick Charge Kit. In two hours, a rechargeable battery pack is ready for up to 40 hours of gaming. The base can also hold a second pack, for dual charging. 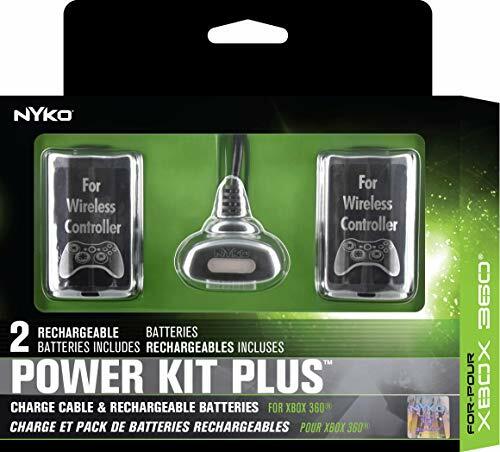 Recharge in a flash and kiss disposable batteries goodbye with the Xbox 360 Quick Charge Kit. Charging a single battery pack for two hours gives you up to 40 hours of play with your wireless controller. The charging base can also hold a second pack, for dual charging in just four hours. Save a bundle on disposable batteries, and get more gaming with less waiting. If you have any problems with the product, we will answer you in the most welcoming way. Made by Third-party. Perfect support original wireless gamepad and other non-brand wireless gamepad. 4800mAH Long lifetime battery provides additional game time.It offer 18 hours of play per charge. 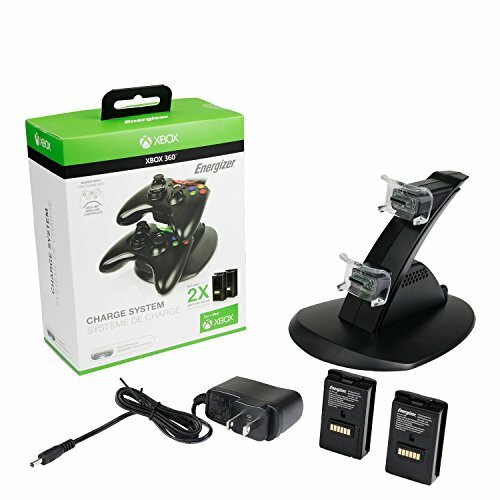 4 in 1 chargr kit for your xbox 360 controller,included charger cable and rechargeable battery. Charging the battery via the cradle as a back up solution. Customer Services: If you have any problems with the product, we will answer you in the most welcoming way. 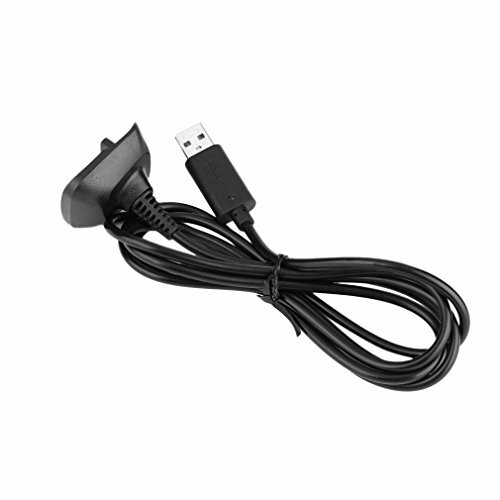 Features: This is a the USB Play Charging Cable USB Charger, For Xbox 360 Wireless Game Controller. USB cable allows you to charge your Microsoft xBox 360 Wireless Controller while playing games. Charges for XBOX 360 wireless controllers through any USB port. Never runs out battery again while you are about to strike your final score. Dual color indicator to show the charging state:Lights red-Charging;Lights green. Descriptions: Charging time lasts for about 3-4hs, depends on the left capacity of battery in controller. Specification: Work temperature:0-70 Centigrade . Work voltage:DC 5V . Cable Length:around 1.54m Original box: NO Color: Black Packing content: 1 x USB Charging Cable For Xbox 360 Controller Note: Accessory ONLY, for Xbox 360 Controller NOT Included! USB cable allows you to charge your Microsoft xBox 360 Wireless Controller while playing games. Charges for XBOX 360 wireless controllers through any USB port. Dual color indicator to show the charging state:Lights red-Charging;Lights green. Recharge while you play or afterwards, even when your Xbox is in standby. The long-lasting rechargeable battery fully charges under 4 hours. Say goodbye to disposable batteries and having to swap them out in the middle of a game. Let you enjoy your game without any obstacles! This Rechargeable Battery Pack is fully compatible with the Xbox One, Xbox One S and Xbox One X controller, you may get 12 hrs playing time which just takes 4 hrs for fully charged. Li-ion rechargeable battery, which is much better than Ni-MH and Ni-Cd in capacity and lifetime. Shorter charging time, lighter weight and no more problems with capacity fading in comparison with the Ni-MH battery. LED indicators shows the charging status: Red- charging, Blue- fully charged, much more convenient for your usage of this batteries pack. The Micro USB lead could transfer data, so it can be used by other devices (such as a phone to PC to show as storage) or to use the controller on a PC without a wireless receiver. Warranty Policy: 100% Money Back guarantee and 12 Month Warranty guarantee. Please just freely contact us for any quality problems, we would be much glad to help you out, full refund without any ask. UKor as a professional manufacturer adhere to 100% Pre-delivery Inspection,promises all products can work fine before delivery. All our products offer 30 Days full refund warranty and 12 Months free exchange guarantee,24H x 7 email support. 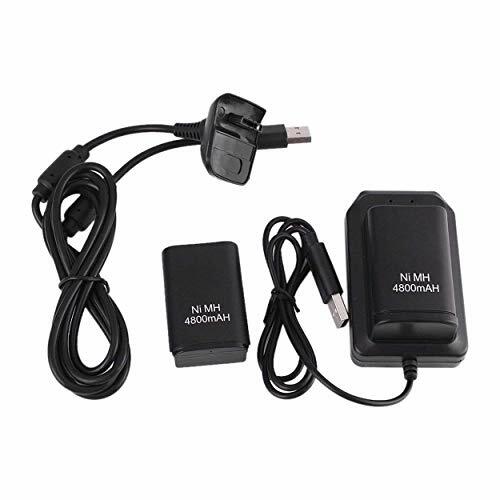 - Its auto voltage feature allows the adapter to be used worldwide. - Rubber feet to prevent unnecessary slip and slide movements. - Input: AC 100-240V ~ 4.91A 47-63Hz. - Output: DC 220W 12V-17.9A; 5Vsb-1.0A. - If the Xbox One turned off,and the fan keeps run and make a bit noise, Go to settings>power and startup>power mode and startup. Change your power mode to energy saving and that should solve your problem! -If the Power supply is still on while the console is off, you must remove the instant-on power mode and instead activate energy saving mode. -To increase the lifespan of the unit, unplug your Power Supply cord from the outlet whenever it's not in use. Place this accessory in a well-ventilated location. The power supply becomes hot if it is placed in a location where there is not enough air flow (ex. inside a box or cabinet). Upgraded Version-More Quiet: An latest updated radiator fan system that makes for little fan noise. Made of ABS material with mesh edges for optimal airflow. No disturbing noise and overheating. And it has longer lasting life, you can enjoy the fun of games longer. 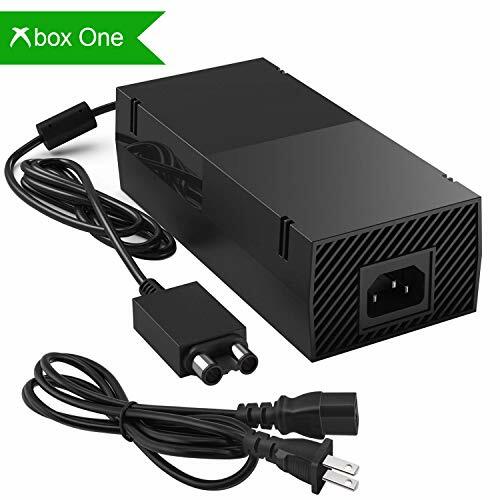 Xbox One Power Brick: Perfect Designed for Your Xbox One,The Xbox one power supply is compatible with Xbox one console, but not Xbox One S or Xbox One X consoles. LED Light Indicate: Xbox One power supply has different LED indicators to show its status. When the connection is secure,LED lights up: Green-Power On, Orange-Standby. When the connection is error, state of LED Light is off or blinking. Worldwide Compatible: It is Global Universal Adapter, Input:AC 100-240V ~ 4.91A 47-63Hz, Output: DC 220W 12V-17.9A; 5Vsb-1.0A(Standby), auto voltage (100-240V) allows the ac adapter power supply to be used worldwide.Let the happy game time follow you anywhere in the world. Brand Warranty: Buit-in smart chip against Over-Heated/Over-Current/Over-Voltage/Short-Circuit . And UKor provides 30-Day money-back guarantee for any reason, 12 Month warranty for quality-related issues. 7*24h customer email service.